“A complex and captivating tale” (The Boston Globe) which takes an engrossing look at the darker side of a marriage—and at how an ordinary family responds to an extraordinary crisis, forcing a couple to decide when a marriage is too broken to fix. Maddy, a social worker, is trying to balance her career and three children, but her husband’s verbal furies have made the family wary and frightened. Where once his fiery passion had been reserved for defending his clients, now he’s lashing out at all of them. She vacillates between tiptoeing around him and asserting herself for the sake of their kids—keeping a fragile peace—until the rainy day when they’re together in the car and Ben’s volatile temper gets the best of him, leaving Maddy in the hospital fighting for her life. Randy Susan Meyers takes us inside the hearts and minds of her characters, alternating among the perspectives of Maddy, Ben, and their fourteen-year-old daughter, Emma. A People magazine Book Pick, Accidents of Marriage is a “beautifully written, poignant, and thought-provoking novel” (Kirkus Reviews, starred review) that will resonate deeply with women from all walks of life, ultimately revealing the challenges of family, faith, and forgiveness. "Meyers is quickly taking her place among the ranks of women’s fiction authors who write big-issue novels that explore the inner lives of women in crisis without descending into melodrama or cliché. Readers who enjoy Barbara Delinsky, Amy Hatvany, and Jodi Picoult will want to add Meyers to their to-read list." "Meyers writes compellingly; Maddy’s recovery is detailed and wrenching, as are vivid portraits of the children’s reactions to their family’s turmoil." "I read Accidents of Marriage in one day. Like Meyers' first two novels, this one—about a family paying a high price for rage and trying to reknit itself in the aftermath of the unthinkable—is compulsive reading. It's amazing how warm Meyers' writing is even as her stories grip you by the hand and don't let go." "With the heart of a novelist and the tenacity of an investigative journalist, Meyers flawlessly depicts the evolution and consequences of emotional abuse. A master of perspective with an uncanny understanding of human nature, she has managed to make us empathize with every member of this damaged family. This is an important story, one I’ll be thinking about for a long time." 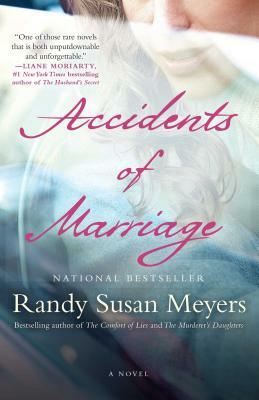 "Randy Susan Meyers is a genius of the human heart, and Accidents of Marriage is a profound education on the complexities of love, imperfection, damage, and responsibility. You'll feel as though a magically insightful friend is sharing the behind-the-scenes secrets of a family you may well know. She tells it like it is. No sugar-coating here, only truth in all its compelling beauty and might." "Every marriage has its secret deals and compromises. In Accidents of Marriage, Randy Susan Meyers explores the vast complexity of this bond and lays out how passion, allegiance and love can go terribly wrong. She gives us characters we root for, even when they’re at odds, and she asks the questions:What is forgivable? When does a marriage become too broken to fix? With wisdom, humor and great compassion, Meyers answers in a story you won’t soon forget." "A bold and poignant look into the complicated, slippery world of what constitutes emotional abuse, Accidents of Marriage explores what happens when tragic circumstance forces one family to reexamine the dysfunctional dynamics that have long-defined them. Meyers deftly pulled me in to this story from the first page, tying me to its tender and fearless heartbeat, and didn't let me go until the extremely satisfying end." "The intertwined traumas of emotional abuse and brain injury careen through every family member in this disturbing and deeply insightful story. Meyers captures the necessity and complexity of excavating the truth as the foundation of life moving forward."